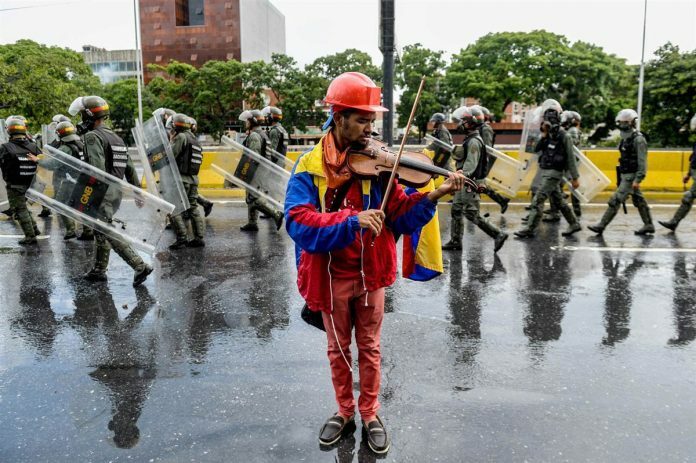 A Venezuelan violinist who has become a renowned presence at the front of the country’s anti-government protests has been taken to hospital during the latest violent clashes in Caracas. Wuilly Arteaga is often seen playing his instrument among demonstrators. “Neither pellets nor marbles will stop us,” he wrote on Twitter, posting a video of his swollen, bandaged face. President Nicolás Maduro has called protest leaders “terrorists”. Footage from Reuters news agency that was shot at the time Mr Arteaga was hurt showed police appearing to fire rubber bullets and tear gas, as some protesters advanced throwing stones and gas canisters. Mr Arteaga was later filmed playing the violin from his hospital bed. A coalition of parties had arranged Saturday’s march towards the Supreme Court to support a raft of judges appointed by the opposition-controlled Congress the day before. The government said it would not allow serving judges to be unseated for the newcomers, and described the Congress move as illegal. The country has seen almost 100 people killed in protest-related violence since April, when political tensions intensified. Mr Arteaga describes himself as a member of the La Resistencia (The Resistance), a vast youth-led movement that has spearheaded the anti-government protests. He became more famous in the country after a video went viral in May, showing him in tears after his violin was allegedly broken by police. The violin was later replaced by a well-wisher, and he soon returned to the streets. In June, he traveled to New York City to take part in overseas anti-government demonstrations, and was invited to the US Congress to meet Representative Jamie Raskin. It has since been reported that Mr Arteaga was a member of the El Sistema orchestra, a state music program championed by ex-President Hugo Chávez, who died in 2013. El Sistema was devised to inspire and educate the country’s underprivileged youth. The government’s supporters praised President Chávez for using Venezuela’s oil riches to markedly reduce inequality and for lifting many Venezuelans out of poverty. But the opposition says the Socialist Party, later led by Mr Maduro, has eroded Venezuela’s democratic institutions and mismanaged its economy. The Latest of Renown Venezuelan Violinist Wuilly Arteaga Injured During Protest in Venezuela as National Guard attacked democratic protesters in Caracas.